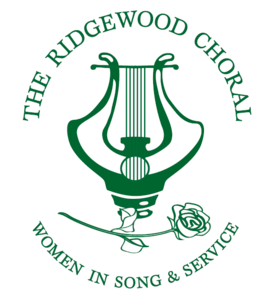 The Ridgewood Choral is a friendly women’s chorus founded by Frank Kasschau in 1928 to enhance the musical culture of the area and to do service for the community. The Choral is dedicated to performing good vocal literature in a variety of musical styles from classical to contemporary, sacred to secular, baroque to Broadway. A special aspect of the Choral is its active social service tradition. During the Depression, the women of the Choral raised money for the Ridgewood Foundation Fund through a series of concerts with the Orpheus Club, the men’s chorus of Ridgewood. The Frank Kasschau Memorial Shell was funded in large part by ticket sales to the Choral’s summer pop concerts, and the group sang at the Shell’s opening along with the Orpheus Club. Proceeds from succeeding summer concerts helped to purchase a grand piano for the Benjamin Franklin Junior High School. With a song in our heart, we continue to serve our community in other ways. Our Holiday Musicale, which began as an intimate gathering for prospective members, today has become a highlight for many area seniors who enjoy our beautiful music and seasonal treats. We take this concert, as well as our spring concert, “on the road” as we perform for seniors who may otherwise be unable to come to us. We also continue to host various social events such as the ever-popular “card and games” party, enrichment trips, and sing-alongs. Recently, collections of school supplies for students in need and contributions to local food pantries have been part of our social service routine. Beginning in 1967, The Ridgewood Choral added a new dimension to its concept of service by creating The Florence Reinauer Memorial Music Award. What began as a $250 award has grown to a $2,500 scholarship. In 2018, The Ridgewood Choral announced it will be adding an additional scholarship – The Marjorie Vandervoort Vocal Award – in the amount of $1,200. This award honors Marge’s 25 years as our esteemed conductor and friend. Under her baton, the Ridgewood Choral has continued to grow and flourish, expanding our repertoire and vocal abilities. Both awards are offered yearly to a senior high school musician who meets our criteria for excellence, and both awards offer performance opportunities at our spring concert. Click on the MUSIC AWARDS page to learn more about the competition and past winners. The Ridgewood Choral is a not-for-profit organization supported through the generosity of associate members, friends, and our concert audience. The Choral is a member of the Ridgewood Arts Council and the Ridgewood Chamber of Commerce. The Choral is a Silver Charter Member of the New Jersey Performing Arts Center (NJPAC) in Newark, NJ. Ms. Vandervoort currently serves as assistant conductor of Ars Musica. She has been associate conductor of the Rockland Camerata, guest conductor of Harmony Basket Chorus (a choir of Japanese women), as well as director of church choirs. A resident of Closter, New Jersey, Ms. Vandervoort runs her own art and custom framing business, The Mirage Portfolio. She and her late husband Robert have 3 daughters, with grandchildren and great-grandchildren completing the family. Susan LaFever has been the Pianist/Accompanist with The Ridgewood Choral since 2008. Ms. LaFever is a multi-faceted multi- instrumentalist, vocalist and conductor. Ms. LaFever holds a Bachelor of Music Performance in French Horn and Piano, and while earning her Master of Music in Horn Performance, was awarded a full assistantship to serve as pianist in the vocal and instrumental studios. At present, she is also in her second season as Director of The Ridgewood Singers. Ms. LaFever has served as the pianist and assistant conductor of The Ridgewood Gilbert & Sullivan Opera Company, The Lakeside Choraliers, and the Teaneck Community Chorus. In addition, she was an Academic Specialist in Choral Accompanying at Kean University and past pianist with Garden State Opera and Ars Musica Chorale. She has accompanied Broadway stars, members of the New York Philharmonic and other soloists in concert and was conductor/pianist of the Northeast tour of Scrooge, The Musical. For the past few years, she has been one of the pianists at Montclair State University where she has accompanied lessons, played opera rehearsals and performed recitals. Ms. LaFever was reviewed by the New York Times where her playing was called “bold and striking” with “a confident lyric quality”. On horn, she is a frequent recitalist and soloist and has toured the U.S., Europe, Central America and Asia. She has given master classes at the University of Iowa, Western Illinois University, and the University of California, Santa Barbara and has presented clinics and performances at several Northeast Horn Workshops, the International Women’s Brass Conference, the International Horn Symposium, and the National Flute Association Convention. Recently she collaborated with composer Jeffrey Kaufman and pianist Joshua Pierce to record Sonatina for French Horn and Piano available from Phoenix USA records. Susan has degrees from Union College, University of Nebraska, and Manhattan School of Music. To all those Ridgewood Choral members who have given of themselves outside of formal committees, we thank you for your time, talents, ideas, generosity, pride and love.